This is a leisurely bicycling tour around Asuka under the guidance of local instructors. Somehow even foreigners visiting the Asuka area for the first time feel an intriguing sense of nostalgia for the place. One reason may be that the entire village is carefully protected under the Ancient Capitals Preservation Law, aimed at conserving both the historical and cultural heritage of Asuka and its surrounding natural environment. During the tour, you can unravel the mysteries of the ancient tombs and stone objects, imagine the old capital as it was 1,400 years ago, and explore the breathtakingly beautiful scenery of terraced rice fields. 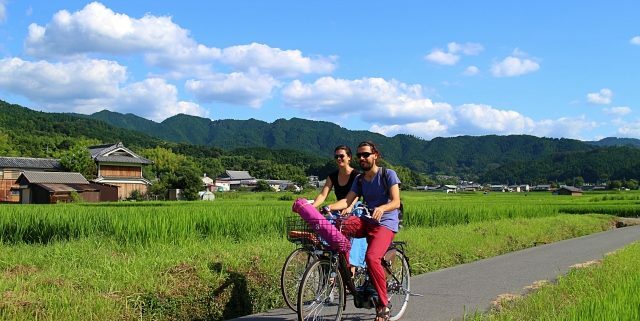 This cycling experience will enable you to see, hear, touch, contemplate, and imagine Japanese rural life and satoyama scenery at its best. Come and enjoy a charming bicycle journey, getting to know villagers and greeting the friendly locals along the way. Agricultural Experience in Asuka (With Lunch). OK in Any Weather! A farm nestled within the beautiful satoyama scenery of Asuka. In this tranquil setting, you can experience a new method of recycling-style farming. 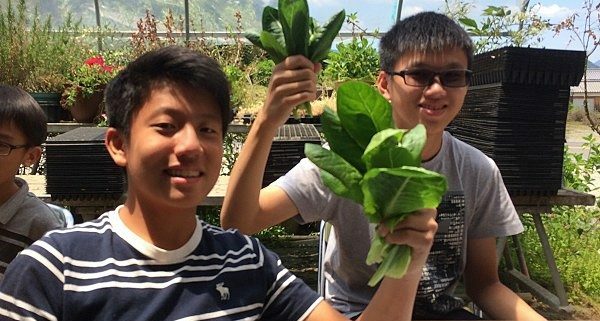 In just a few hours, you can try your hand at a whole series of tasks—sowing seeds, planting seedlings, and harvesting produce. Finally, you can even pack the vegetables you pick to take home as a souvenir. After your farming experience, you’ll enjoy a well-deserved lunch with local farmers. Lunch is a bento lunchbox featuring seasonal vegetables, prepared by “PocaFrere,” a restaurant that uses remarkably delicious vegetables. https://english.asukamura.com/wp-content/uploads/2019/03/agricultural-experiance-in-asuka.jpg 450 600 Asuka admin https://english.asukamura.com/wp-content/uploads/2016/07/title02-1.png Asuka admin2019-03-30 11:00:252019-04-02 18:07:18Agricultural Experience in Asuka (With Lunch). OK in Any Weather! Some 1,400 years ago, the first capital of Japan, as a nation state governed by laws, was located right here in the Asuka region. The village of Asuka, located at the region’s heart, boasts a local dish that has been loved for many centuries. “Asuka-nabe” is a hot-pot dish prepared by cooking chicken meat and seasonal vegetables in a chicken-based stock. The addition of milk to the stock gives the dish its characteristic pure white appearance. The idea of adding milk to a hot-pot might seem strange, but the milk actually gives a unique mellowness to the full-bodied stock. The distinctive smell of milk is barely detectable, so even people who generally dislike milk happily eat this dish. Asuka-nabe is said to have originated with a monk who came to Asuka from Tang dynasty China during the Asuka period. He would apparently prepare himself hot-pot with goat’s milk to help endure the harsh cold winter. This means the dish is more than a 1,000 years old. When you visit Asuka you can savor its ancient romance not just by looking and listening, but also by tasting. Asuka-nabe only by reservation for 2 people or more. ¥3,780 per person. “Asuka-nabe set” (¥1,080), available only from November 30 to February. “Koyuki-nabe set” is also available. You can request Asuka-nabe for your evening meal. Please inquire in advance if interested. Note: Quoted prices are as of Nov. 2018; prices may change over time.